If you could do something for your kids that would increase their IQ, enhance their memory, verbal skills and critical thinking while fostering emotional intelligence and confidence, it would be a no-brainer. Well, there is, and it’s hiding in the most unlikely of places. It’s called chess. Yes, that chess. And no, your kids are not too young to learn. At least that’s what Tyler Schwartz and Jon Seiber realized when they introduced Chess at Three, an after-school program that teaches the game to kids as young as three through a powerful storytelling method. Yes, the pieces spring to life, where kids learn sequencing, strategy, language and math all through connecting with the characters on the chess board. We sat down with Chess at 3’s director of tutors, Harlan Alford to talk about the program and why storytelling is such a meaningful teaching mechanism. Can you tell us how Chess at Three got started? Chess At Three was created by Tyler Schwartz and Jon Sieber. Tyler taught chess at the Village Chess Shop and was approached to teach chess to 3 year olds, an age younger than anyone has taught before. After several lessons it was not working. His traditional attempts to teach chess were not affecting the children. The kids were not having fun with the game. So one day he made a story up about the piece that was super funny and had all the children cracking up. The story simply told how the King moved. The kids loved it. They wouldn't stop talking about it that week. So the school’s staff brought Tyler back. And he did it again. The kids fell in love with the game because they loved the stories and the characters. Tyler brought Jon on to see what he was doing. Jon is not a strong chess player but had been working with children for years. Jon tried teaching a lesson through stories and it was fantastic. This is the moment that I think is special. Realizing that fun is the best way for young children to learn. Games are important. We can teach them sequencing and strategy, how to win and lose and how to work on language and mathematics all in a fun lesson with silly teachers that love working with children. What was your “trigger moment” in the program’s development? Our trigger moment was when the stories were developed. When we realized if we get children having fun playing chess they will fall in love with it. If we tell them stories and develop a world, they will dig into it to discover more and more. The other trigger moment was when we realized that we didn’t have to be grandmasters to teach these kids. We needed to be amazing storytellers. Stories are a powerful tool. Being told what to do doesn’t help us absorb what we need to know or to do or how to play, but being set free in a world to discover it for ourselves does. And our teachers are incredible story tellers and creatives who make the game come alive. That makes total sense. What are some of the benefits to teaching kids chess? Is there a good age to start? 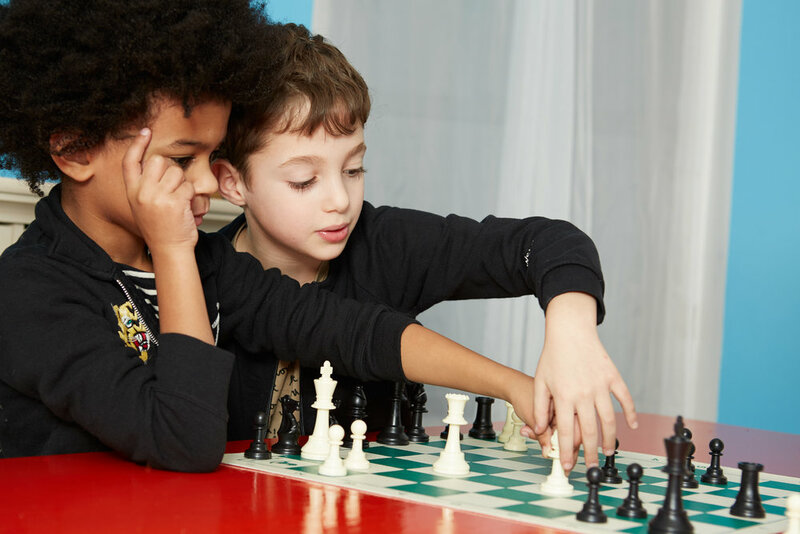 While people of all ages (3-93+) benefit from playing chess in a variety of ways, starting at a very young age can jumpstart early childhood development. We discovered that teaching chess at the surprising age of 3 is both possible and beneficial. So we believe this is the best age to start. Wow. That’s incredible! I'm sure the kids teach you a great deal as well. What have you learned the most from working with kids? Kids are the best! Well I’ve personally learned that I’m not as sneaky as I thought I was. They are very perceptive, not a lot gets past them. I’ve also learned to be clear, intentional. Kids don’t stand for insincerity. Having fun and being genuine is the best way to get anyone to listen. Yep, we would agree with that. Can you tell us what are some of the next big steps for Chess at Three? We will soon be rolling out our own chess board game. I know there are hundreds of them out there but ours is going to be completely different. It will still keep the traditional chess pieces so kids can learn exactly what chess is, not just a version of it, but then we developed a way to incorporate our silly characters to the pieces as well. And our stories will be attached. It’s going to be super fun and helpful so that when a tutor is not around parents can play with their kids and everyone can have a blast. We’re sure we’ll learn a thing or two as well! Lastly, what makes you fly? Figuring out how creativity and strategy can come together and provide something for people. I believe we are doing that. We want to help parents get their children ahead. Chess is the best way to do that. It has all the ingredients to make the best brain and I believe we have created a learning experience that allows kids at a very young age to gobble up good learning tactics. Every day is my favorite day of the week when you get to play games and tell stories!